We understand how challenging and complex usability can be in device design. Cognition Corporation, a software company specializing in medical device compliance and commercialization, has just released a new white paper discussing the benefits of usability engineering in risk management activities. FDA is more adamant than ever about medical device, pharmaceutical, and combination product organizations making sure they implement usability engineering into their design processes. They strongly encourage organizations to adopt activities that will satisfy the “inherent safety by design” principle. 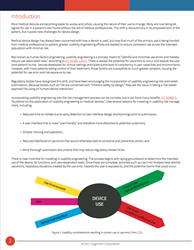 The white paper identifies how to begin usability engineering during the design phase and the steps it entails. Covered steps include: developing use specifications, identifying functions and tasks, and working up use scenarios. The paper also discusses how Use Error Analysis incorporates those steps into a robust set of risk activities to better identify and control use error risks. The white paper is available for download here. Cognition Corporation, based in Lexington, Massachusetts, has offered solutions for product development compliance for more than fifteen years. Cognition’s core product, Cognition Cockpit™, is used by thousands of users worldwide to manage their product development process and meet regulatory, performance, re-use, and time-to-market goals. For more information, visit http://www.cognition.us or call (781) 271-9300.